We recently bid my husband farewell on his second deployment after a grueling year of work ups. It’s been three years since the last time he deployed, and even with regular detachments that took him away from us for weeks at a time, I feel as though we had been lulled into a comfortable rhythm that made it feel as if he’d never leave for a full deployment again. Talk about a wake-up call. In the days leading up to Ben leaving, I started to revisit memories of his last deployment and how I made it through. The night that he left, I lie awake in bed thinking, “How am I going to survive this long all alone with children? HOW? !” And slowly the survival skills that I learned the first go-round began to resurface in my mind. The tips and tricks that kept me sane, comforted me in my weakest moments, and united us with Jesus during one of the most challenging times our family has endured seemed worth writing down as we undergo it again. I hope they bring strength and peace to anyone whose spouse is also gone or will be soon. How in the world could we make it through without prayer? It feels as though I pray twice as much on deployment as I do during any other season of life. “Lord, give me the strength to get through this day…”; “Holy Spirit, guide me as I make decisions for my family alone…”; “Blessed Mother, please keep Ben safe from all harm…”; “Jesus, help my children sleep all night…I’m exhausted.” He never tires of listening, and I never grow tired of asking for more help. The Lord wants to walk with you through this challenging time. Let Him! I’ve have found that journaling regularly is not only therapeutic, but allows me to go back and see what we have gone through. Ben also keeps a journal about the important things that he’s doing on the aircraft carrier. So many things feel like we will never forget them, but by the time cruise is over, countless memories have passed that would otherwise be forgotten had we not written them down. Also, writing Ben an email every day, complete with photos, helps him feel more involved in what’s going on in our daily lives. For holidays, special occasions, and when I can remember it, I break out the video camera. We love looking back at old videos, even if they’re short, to really bring those important times that we may have missed as a family to life. 3. Spend time with family and friends. One perk of having a spouse gone for months on end is that it creates the opportunity for us to stay with family who live far away or have family visit us. Living in my parents’ home for months at a time as a grown woman with children may not sound appealing at first, but it does provide a unique sense of comfort during deployment, and let’s my children get to know their extended family better. That is something to be thankful for. Deployment is a great time to connect with friends, new and old, too. The Officer Spouse’s group, in particular, quickly becomes our second family when Ben is gone, since their spouses are deployed as well. The time that we share together is comforting, even if it’s just sitting together having coffee or wine. 4. Have Masses said, candles lit, & special intentions added to prayer lists. 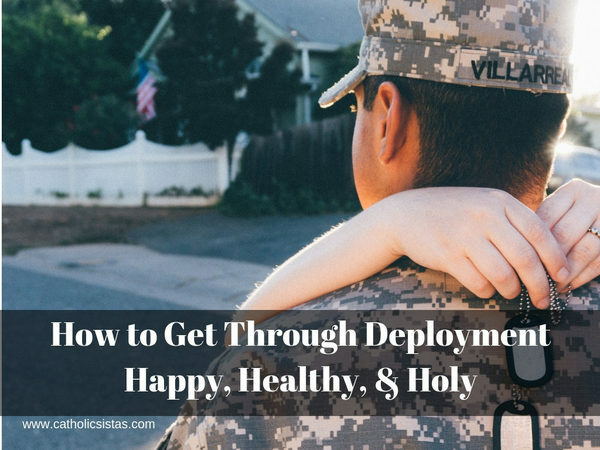 Deployment is the perfect excuse to really embrace all the beautiful “extras” our Catholic faith provides as means of support and prayer. The transitions your family must endure, the safety of your service member, peace in our world… all strong reasons to light those candles that you pass by in the back of the church, have Masses said for special intentions, and invite your Bible study or other church communities to add your special intentions to their prayer lists. Then sleep peacefully knowing your family is being wrapped in God’s loving embrace through the prayers of others. 5. Plan ahead for children. Any deployment is long, but it’s especially long with kids. It’s important to bridge the gap, incorporating Daddy as much as possible during that time apart. One thing that we have found helpful is having Ben read our kids’ favorite bedtime stories and record them on my phone, so they can easily watch them whenever they like. We also made Flat Stanleys of the boys, so that Daddy could send pictures home of them traveling the world with him. We got our sons dolls with Ben’s full-body picture on them (“Daddy dolls”), so that they can take Daddy with them wherever they go. And finally, before Ben left, we did as many holiday activities together as a family that we could, like visiting the pumpkin patch and taking pictures in costumes, since we knew we’d miss many holidays together. None of these things make up for the fact that we don’t have the real Daddy at home, but they certainly ease the pain a bit. 6. Set goal lists to accomplish. Daily, weekly, monthly…just write down all of your goals and go for them! Anything to make the time go by quicker, while being productive is a good thing. Some of my favorites include: weekly adoration, work-out routines, cleaning out closets, trying new recipes, and small decorating projects. If there is an opportunity to visit your spouse in a foreign country, GO. Call Grandma to spend time with the kids for a week (remember what I said about getting to know extended family?) and go spend alone time with your husband! Your marriage will thank you later. While they can sometimes seem like an inconvenience, care packages are a great way to make your spouse feel a connection to home and give you something fun to put your energy into. I always enjoy searching for funny gifts to go along with the practical things I send in Ben’s care packages. Sometimes a set of Nerf guns or a silly Donald Trump coloring book is just the thing to lighten the mood on the carrier after a long day, or so I’ve been told. 9. Be flexible (with yourself, your spouse, and your children/schedule). Have I mentioned that deployment is hard? One more time for good measure: Deployment. Is. Hard. It’s also kind of not real life. Everything is turned upside down on its head. Emotions, schedules, workloads, housework… Because of the chaos that comes along with it, it’s imperative that you keep reminding yourself to be kind to yourself…and your husband…and your kids. It’s okay to eat cereal for dinner occasionally or push bedtimes back a little too often because you’re riding bikes in the middle of the street after dark or rewash the same load of laundry three times because you just can’t manage to get it into the dryer on time. Cut your family a little slack. You’re all going through a lot. 10. Bask in God’s goodness. When you catch a moment to breathe, try to see the hand of the Father guiding you through this time apart. Fewer things make me feel so alive. For better or worse, the raw, intense emotion of telling my husband “goodbye” not knowing when I’ll see him again or comforting my little boy for the umpteenth time because he misses his Daddy and doesn’t understand what “a really long time” means or falling into bed with the most intense sense of purposeful exhaustion makes me look at my life through clearer eyes. How fleeting time is, but how meaningful we must make it. If we allow it to, deployment has the capability of transforming us into more intentional, loving beings. And isn’t that the whole point of our lives? How lucky we are to have done two…so far.